Kim Perell made headlines for her amazing transformative story of a startup entrepreneur to an internationally renowned CEO and prominent angel investor. From her modest beginnings at her kitchen table, she went from broke to multi-millionaire in just a few short years. Today, she has investments in over 70 startups many of which have been sold to some of the largest Fortune 500 companies. Now, in The Execution Factor, she offers indispensable wisdom as she shares her personal journey and proven program for achieving success. 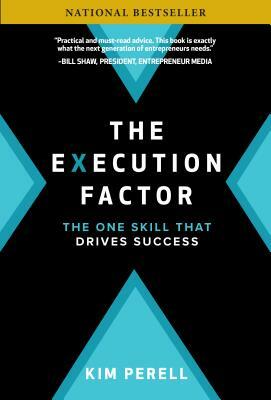 The Execution Factor offers a straightforward approach to success -- deliberately designed in a way that anyone can master. Perell flips the notion on its head that success is all about having a great idea, an advanced degree or a high IQ. Because people around the world have achieved their dreams without any of those things. Perell believes the ability to execute is the difference between success and failure. The Execution Factor is for anyone looking to transform themselves from a "dreamer" to a "doer" and will make you feel like you have a success coach by your side. Perell teaches her unique 5 traits of execution: vision, passion, action, resilience, and relationships. By the time you've completed the book you will have a have a blueprint to achieve your dreams in business and in life. Don't settle for ordinary when you can have extraordinary. Master execution and change your life. Kim Perell is an award-winning entrepreneur, executive, angel investor, and the CEO of Amobee, a global marketing technology company with 21 offices worldwide. Amobee has been recognized as one of Fortune Magazine's Top 10 Places to Work in Marketing & Advertising. Laid off at 23 from an internet startup, Perell began her journey as an entrepreneur from her kitchen table, becoming a multi-millionaire by the time she was 30 and selling her last company for $235 million.Perell attributes her success to her ability to execute and believes execution is what makes the difference between success and failure. She is confident that execution is a skill that can be mastered, and actively seeks to teach it to others. Her passion to help young entrepreneurs achieve success has led to her being an early stage investor in over 70 startups, 14 of which have been successfully acquired, and one that went public with a current market valuation over $3 billion.